My Bad....After taking a look at what some of the other designers created, I headed back to the studio, grabbed some of my Stampotique images, left A LOT of White space and over and hour later, came up with this Anniversary card. So why the hour you ask? The Red Ink/Marker just would not dry, either I'd smudge and get ink on my finger, or color out of the lines. 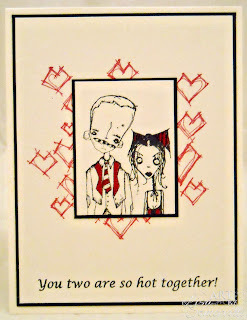 So needless to say I have a bunch of the stamped couple sitting on my desk!This weeks SDC is open to any stamp company, so grab your stamps and play along with the CAS Challenge for your chance to win a Stampotique GC! C'mon, you know you want too! I love both cards. The one you used "gooseneck" is my favorite. Lisa - your post really made me smile!! I don't think anyone ever said CAS was easy or quick! 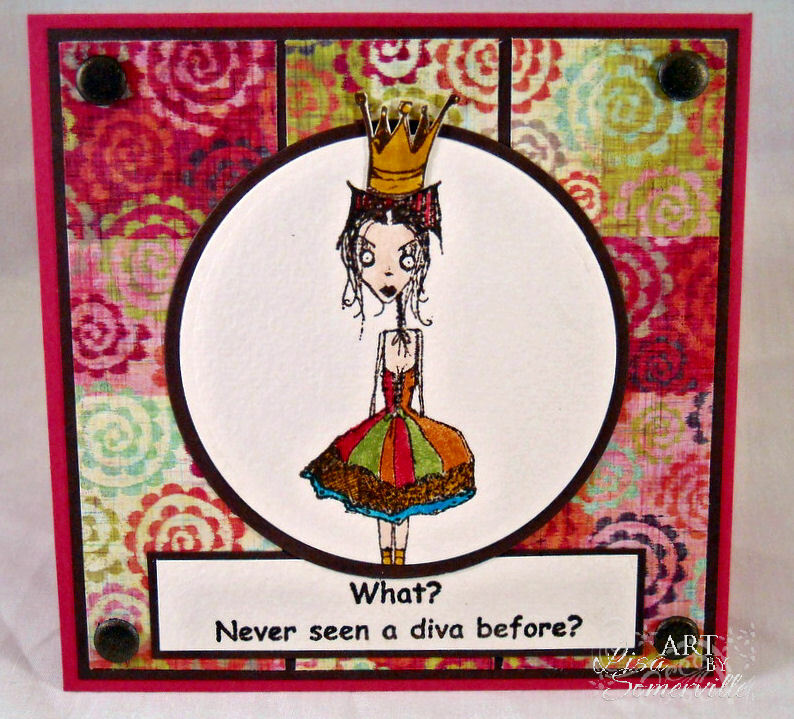 :)))) I really like the diva card - the backing paper is super and I love the image. However, I think you nailed the CAS look on the anniversary card - it's simply brilliant!! lol Lisa! love your explanation! Your cards are BOTH brilliant! Love both cards, but the second one is my favorite! These are awesome! And I struggle w/ CAS too! I always want to sponge the edges and do a little distressing! But, you did a great job here!!!! You do well with the 'odd' Stampotique images, Lisa. I stuck with the standard ones, and I'm crediting you with a CASE on my blog...and on TJ. Pretty sure I can't do a CAS or single layer! Both are fabulous and you did not fail! Lisa, you made my day. People tell me my cards are CAS and I took it to mean not as talented as more complex designs. I have renewed pride in my designs after reading your post. I appreciate you sharing your struggles. Been there, done that! Have. Great day! OMG! ROFL!!! I *** So*** get the dirty and complicated! I love that. And I love both your cards. To me CAS is mostly no embellishments. :). You did great with the CAS. LOL about your blogpost (and oh how I recognize the smudging part... I have a whole bunch of butterfly cards on my desk :-) ). 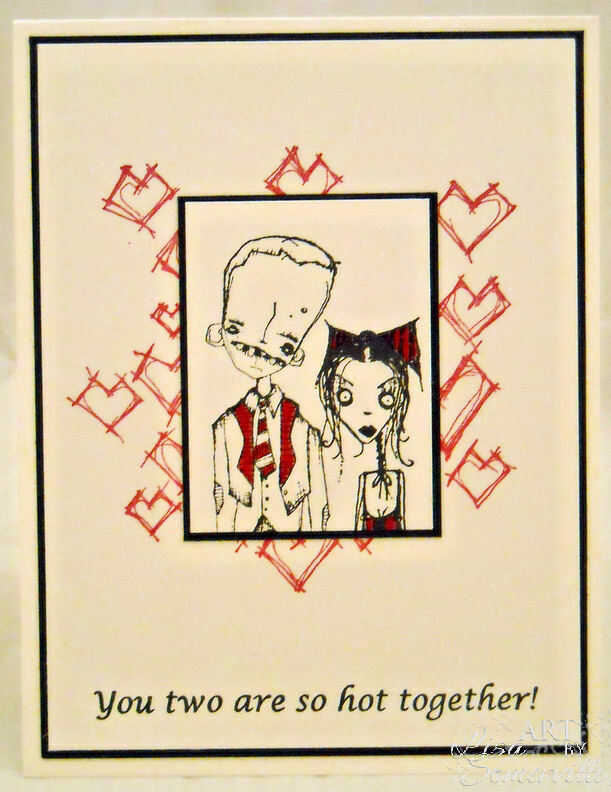 But I love both your cards, I love the layout and the gorgeous backgroundcolours of the first and the strong black-white-red of the second! your post made me smile! first of all you did NOT fail!! it was CAS for you!! and beautiful. but your second one is true CAS in anyone's book! and wonderful! I'm glad you said you find it hard, because even though I do CAS all the time, some of then take ages, and I look at it when I'm finished and think "how the heck did that just take me an hour-- and three ruined cards??" CAS is so hard and you aced it with the second card and the first card is a LISA does CAS. LOL! Wonderful and funny cards! I love them both Lisa. Thanks for sharing your bloopers, I sometimes think I am the only one who is left with multiple mistakes when the project is done, lol. I really like the second card - it just feels more genuine. Both of your CAS cards are wonderful. The first just had print space instead of white space. The second card is amazing with your choice of images and color. At least you've worked on your card, this challenge has me holding back. Your not the only CAS challenged person.